Newly coined Obama chief of staff Rahm Emanuel was on his best behavior during his Sunday show debut this weekend – measured, calm, bi-partisan. But when it came to the notorious ability of the Illinois political street fighter to mangle the English language – well, let’s just say Rahm hit a touchdown. Friends and colleagues – particularly in the Clinton White House - have dubbed this phenomenon “Rahmbonics” over the years and on “Face the Nation” and “This Week,” Emanuel engaged in a veritable festival of mixed metaphors. The jumbling began during a discussion of how Washington leaders have put off dealing with energy issues since the oil crisis in 1974 and health care for nearly just as long. "We had a crisis, we kicked it down the can," Emanuel explained to "Face the Nation" host Bob Schieffer. "These are – just taking those two examples, these are crises you can no longer afford to kick down the can," he continued. "The crisis we have here, the American people know we have one and they are ready and willing to start to tackle those problems. You cannot afford now to kick those down the can any longer." To which Schieffer simply replied, "All right," and moved on. "Kicking the can down the road" has been a favorite metaphor politicians have used to describe someone who is postponing a decision or avoiding an issue. 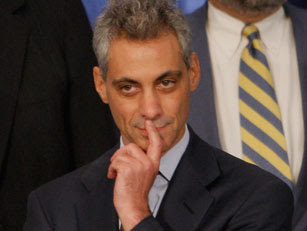 But Emanuel's Yogi Berra-style translation of the phrase should come as no surprise to those who know him well. Speechwriters in the Clinton White House, where he was an aide, used to collect choice examples of "Rahmbonics" and post them on a bulletin board. Oftentimes they involved sports. "He'd say something like you can't kick a field goal in the ninth inning," recalled Jake Siewert, a longtime friend as well as a former Clinton press secretary and longtime admirer of Emanuel’s verbal skills. Shutting a revolving door was another Emanuel classic. He used the phrase in 1998 to explain a Clinton plan to require states to report illegal drug use among inmates before receiving federal money for prisons. "We have to slam shut the revolving door between drugs and crime," he told The New York Times. The mix-ups that made it into newspapers, as opposed to those he blurted out in staff meetings, were the ones that intrigued Emanuel's White House colleagues the most. Quoting Emanuel-style metaphors even became a game among some members of the Washington press corps. "You figure if he's quoted in the newspaper he'd given it more thought," said Siewert, adding that Emanuel has a sense of humor about his way with words. "He's pretty well aware of it. I mean he thinks fast and talks fast." Emanuel’s appearances last Sunday made clear his metaphor mixing is a treat the public will get more of in coming months. Despite the disorienting image of "This Week" host George Stephanopoulos addressing his longtime friend and former Clinton White House colleague with the formal "Congressman Emanuel," Emanuel kept familiar when he attempted the "kicking the can down the road" line again in reference to energy, health care and economic crises. "So this provides an opportunity to finally tackle the issues that for too long have been postponed, kicked down the road – kicked down the road, basically," he said. He also suggested bridging the auto industry, when discussing government's role in helping country's struggling car manufacturers. "President elect Obama has asked his economic team to look at different options of what it takes to help bridge the auto industry," he said. "So they are part of not only a revived economy but part of an energy policy going forward." So, to sum Emanuel up: don’t expect an Obama administration to let the clock run out in the final quarter when the bases are loaded – even if the blitz of crises facing the country makes them want to kick the road down the can.